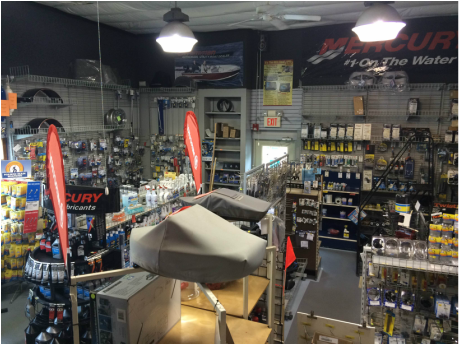 We have access to tens of thousands of accessories for your boat, from cleaning supplies to high-grade Lowrance GPS and Fish Finders. We stock the most common items, but any special orders are usually just a day away. We keep thousands of Mercury parts in stock, however, we can not stock all items. Out of stock items usually take 2-4 business days to receive. Some of the more common Mercury items are stocked by a next day supplier. We service and repair Mercury, Mariner, and post-1995 Force outboards as well as Mercruiser I/Os. Please call ahead to schedule an appointment to have your motor serviced or repaired. During the Spring and Summer months, repairs can be backed up 2-3 weeks. Our labor rate is currently $98 an hour. We cannot and do not work on Mercury Sportjet engines.